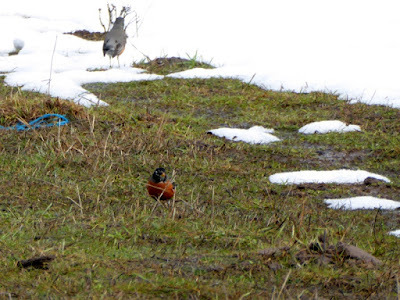 Rural Revolution: What do the robins know? 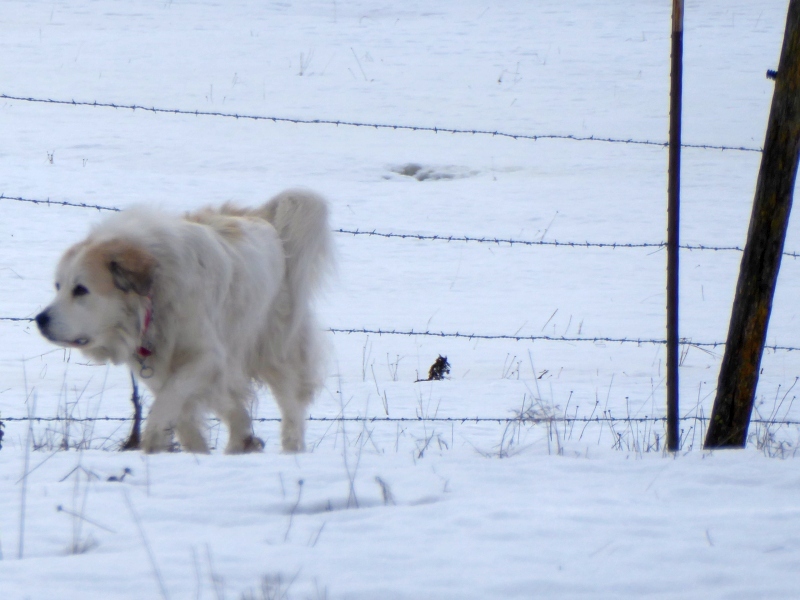 Yesterday Don and I started to take Lydia for her usual afternoon walk along the road, when suddenly he stopped and said, "Let's take her in the pasture." When the cows are not in the pasture, we can just unleash Lydia and let her run loose to sniff, explore, chase, dig, or whatever. However that hasn't been possible since early December when we started getting the snow dumps. It was too deep. But the snow has been slowly but steadily melting off, so for the first time in 10 weeks, we gave it a try. Needless to say, Lydia was thrilled by the freedom. We usually walk the perimeter while the dog explored. 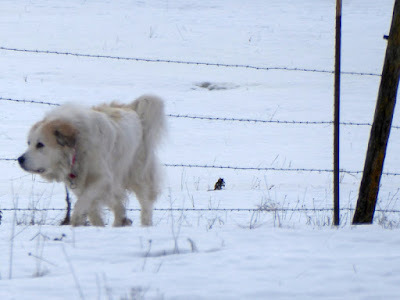 The snow was deeper than we anticipated in some areas, so it was a good walk/workout for us as well. As we walked, we noticed birds. Flocks of birds. 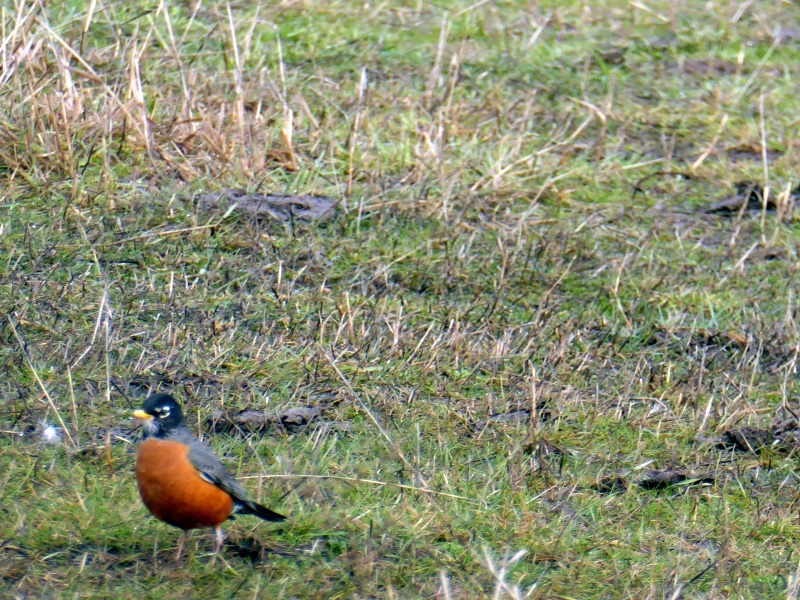 In fact -- robins! 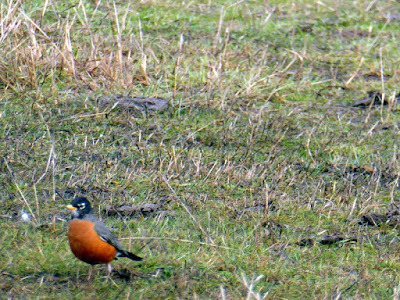 These are the first robins we've seen this year, and suddenly they were everywhere ... and I mean everywhere. "I wonder if they know something we don't know?" I mused. 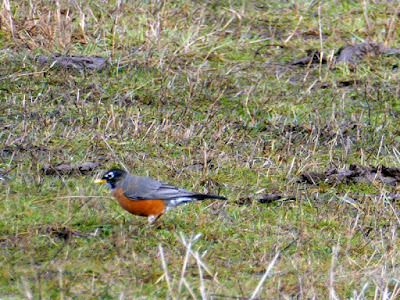 Oh that is wonderful...I saw my first robin a week ago in my yard here in NC....Being from the UP(Mich)/Wis. 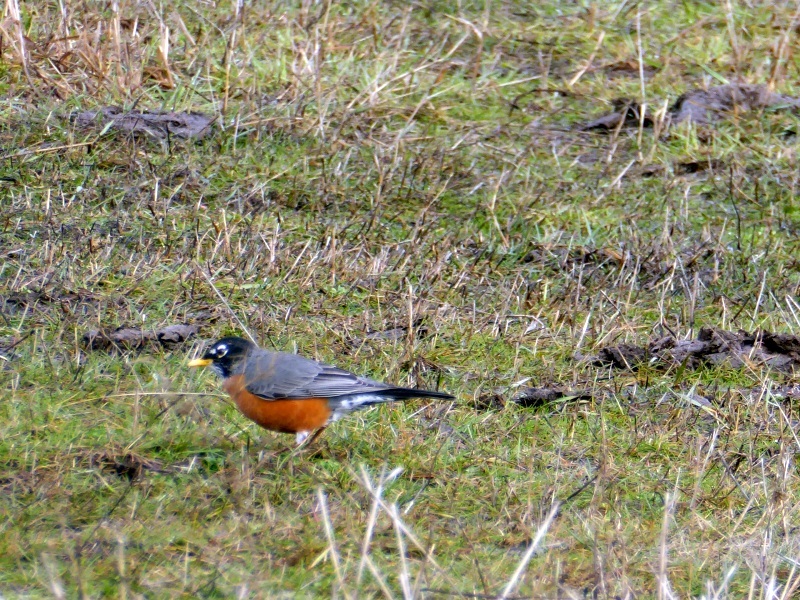 as were always told that the first robins were a sure sign of spring coming soon.....love seeing them. I think so, Ma'am. I only have ever seen them after Winter when Spring is about to begin. They are one of the more pleasant sights of Spring. We had a really interesting phenomena about 5 years ago in north Texas. We had flocks of robins 100,000+ flying over and nesting in the area for about 3 days. I remember thinking that this is what the carrier pigeon flocks must have looked like. We has smaller flocks the next year and much more normal flocks ever since. I have no idea why that year was different but it was. Therewerea few a couple weeks ago, then they left. Must have moved east to your country. If they were here this morning, our snow storm would not make them happy. Weather man said flood alert from heavy rain, and we get snow. Have a fine week up there at the farm. We were on our way to Spokane a few days ago and near the freeway my husband spotted a robin, we were thrilled, we knew spring was not far behind. Can't wait. 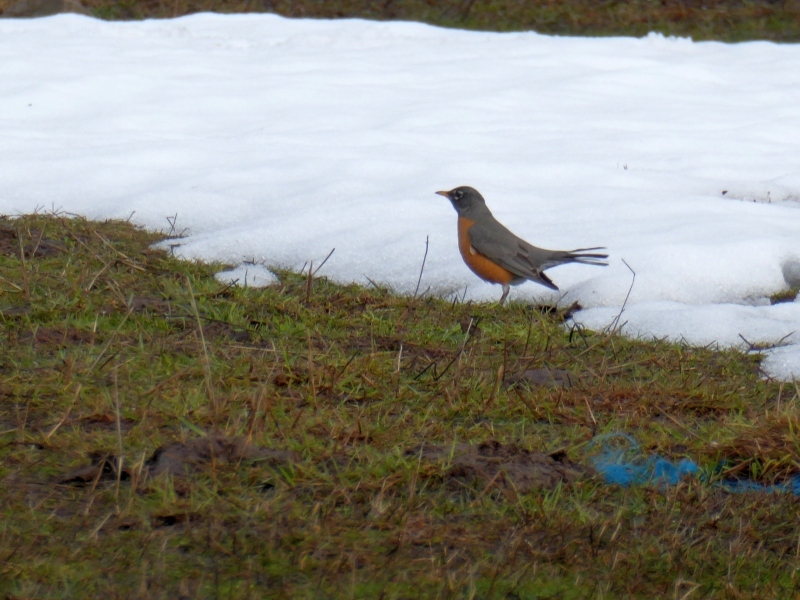 We have always been told that after you see the first robin, there will be three more snowfalls before Spring. 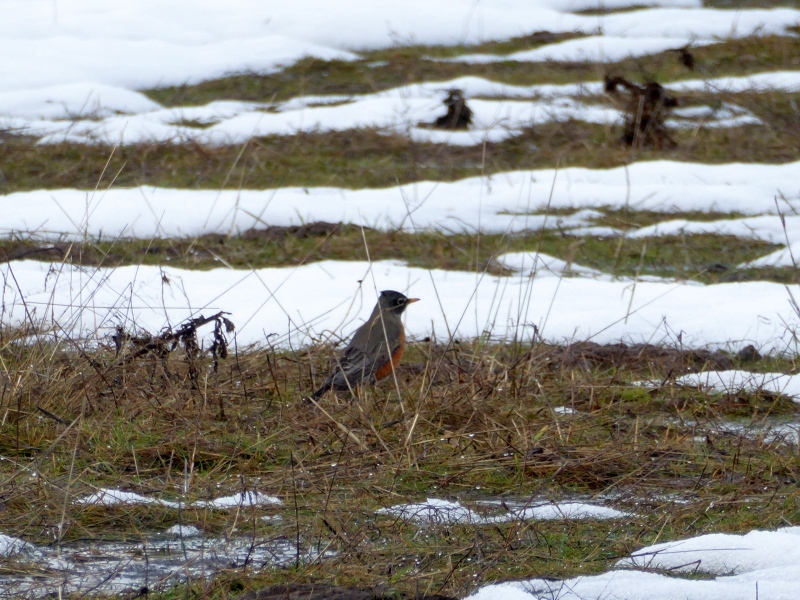 Oh good Robins mean Spring is on it's way. I saw some Canadian Geese which is the same as seeing Robins. Hurray!! I can't tell you how happy I am to see this report about the Robins. My son is a railroad engineer working the grain trains from Spokane to Coulee City. Almost nightly he is out in below freezing temps., snow covered ground, doing necessary but dangerous work. Your weather reports give me a clue as to what the conditions are for him. BTW he helped your friend Enola Gays son photograph some trains when he was in your area. Small world. We've had flocks of robins for the past couple of weeks .... we live in south Florida. Don't know if they are coming or going, maybe they don't either! 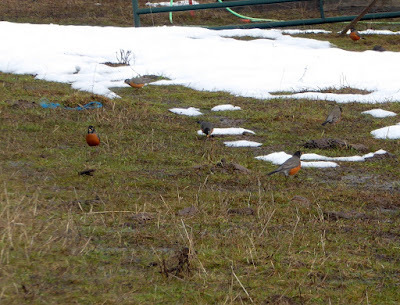 It's funny to me to see so many robins together in one picture. When they arrive here, you rarely see two together in the same yard unless it's a male and a female. If there are more, someone is chasing someone else OFF their territory. 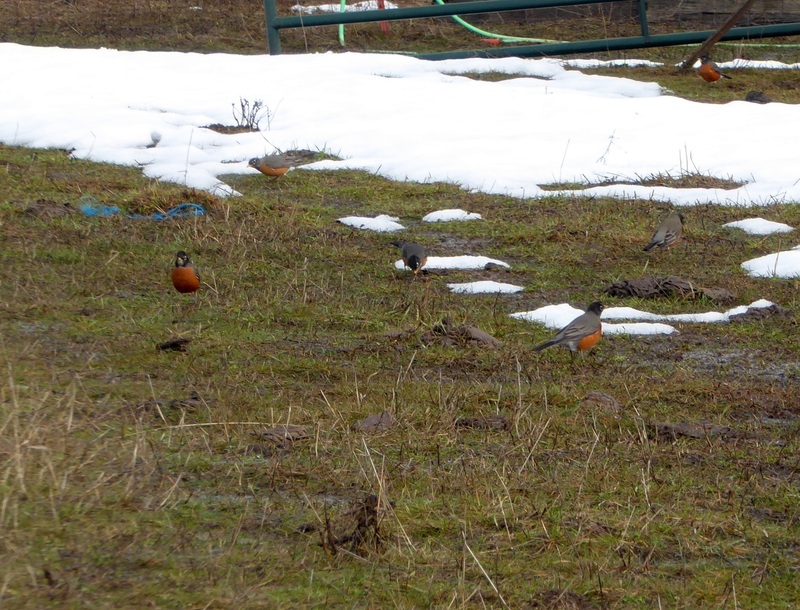 We're in Bonners Ferry, ID and I saw a flock of robins on Sunday. I thought I might be crazy... but hopefully spring is around the corner! So. Much. Snow. We have had Robins in Spokane since mid December - crazy birds! They were inhaling the berries of the Mountain Ash trees in town. 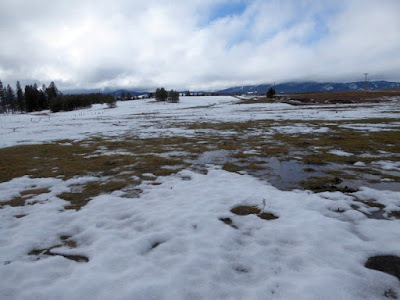 I worried about them when we had that big dump of snow, but haven't found any corpses with the recent thaw so they must be surviving some how.